MAYS LANDING, N.J. – Lined up in clean chef’s whites and paper toques, five teams competing Monday in Atlantic Cape Community College’s Academy of Culinary Arts annual Student Iron Chef Competition – the school’s version of the popular television show – were nearly breathless waiting to find out the secret ingredient. Would it be clams? Squid? 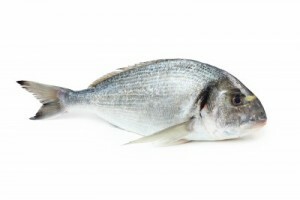 Or scup, the decidedly unglamorous bottom-dwelling fish species known around here as porgie? And by the end of the six-hour exercise – in which the teams of five students each were judged on communication, presentation, and other skills – about 20 dishes had emerged from the kitchens, all featuring the firm, mild-flavored white fish. There were porgie tacos, porgie puffs, pork-fried rice porgie. Porgie was made into soup and served with pasta. It was stuffed, roasted, and pureed. Even a particularly alliterative dish featuring poached porgie with polenta made it into the competition. It all put one in the mind of spam à la Benny Hill.